Had a house-full of people around this weekend, with our former exchange student Lisa visiting from Germany with her boyfriend Jochen 🙂 So much fun showing them around town, picnicking at the Pizza Farm in Wisconsin, and waterskiing at the lake. After they left on Saturday, mom and Sarah and I spent a relaxing day here helping Sarah transition from her summer in Panama to her new job/life coming up in Oregon. One of the highlights was a new recipe we found in Real Simple. We made a substitution of Trader Joe’s Harvest Grains (a blend of orzo, couscous, quinoa and others) in place of the quinoa below, but you could also use farro if that’s what you have handy. You’ll notice the recipe calls for pesto, so I’m also including my personal pesto how-to guide for delicious homemade pesto. Enjoy! Cook the quinoa/grains according to the package instructions. Meanwhile, heat the oil in a large Dutch oven over medium-high heat. Add the sweet potatoes, 1 tsp salt, and 1/2 tsp pepper and cook, covered, tossing occasionally, until the potatoes begin to brown and soften, 6 to 8 minutes. Add the onion to the pot and cook, tossing occasionally, until the sweet potatoes and onion are tender, 4 to 6 minutes. Add as much kale to the pot as will fit and cook, tossing frequently and adding more kale when there is room, until tender, 3 to 4 minutes. Serve the vegetables over the quinoa/grains, topped with 1-2 T pesto and some toasted walnuts. Pine nuts, about 2-3 T.
Parmesan cheese, about 3-4 T.
Add more olive oil if pesto is too clumpy or not spreadable. Add more cheese to offset too much lemon. Some people like to toast the pine nuts first; I find it unnecessary. Pesto will keep in the fridge about one week, or in the freezer about 3-4 months. 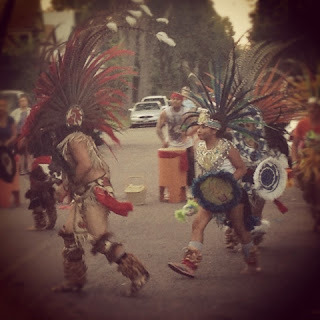 How many of you have Aztec dancers for neighbors? I learned tonight that I do. And they are awesome. For you, my friends, three haiku and a recipe. 1. Boil a large pot of water; add tomatoes to boiling water and pull out when skins pop (time may vary for each tomato). Transfer to cold water and peel skin. Allow tomatoes to continue to cool. 2. Saute onions and garlic in olive oil in a medium saucepan until translucent. 3. Chop tomatoes and add to saucepan, including seeds and juice. 4. Drizzle with olive oil and cook over medium-high heat for about 10 minutes (until some of the liquid in the pan has evaporated). 5. Simmer on low until ready to serve; shortly before serving, stir in basil and salt. Garnish with fresh parmesan cheese.